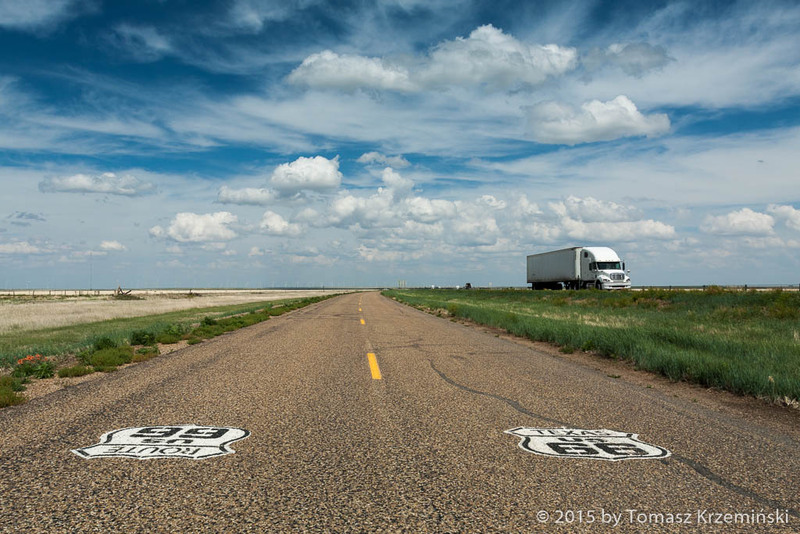 The legendary Route 66 - the mother of all roads. The most popular route in the world is 2448 miles (3939 km) long and flows from Chicago, Illinois, in the north-east United States, through Missouri, Kansas, middle Oklahoma, Texas, New Mexico and on through the old Wild West of Arizona to reach the Pacific coast in Santa Monica, Los Angeles, California. It runs through three time zones. 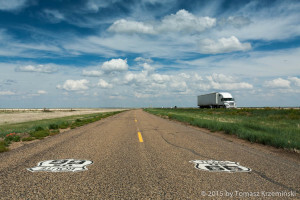 We chose to travel across America in the opposite direction - from the end. We set off from... a wooden pier right at the ocean. 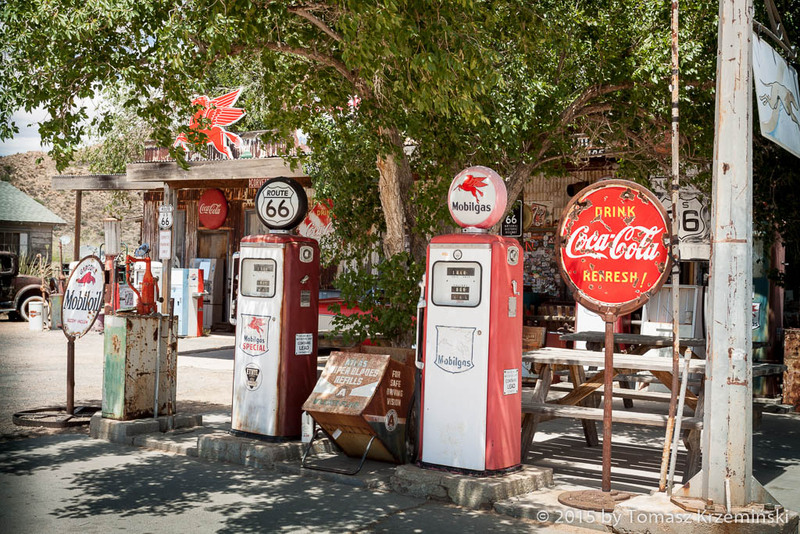 In the first souvenir shop with T-shirts and original Route 66 signs, "proudly made in the USA", after an hour-long talk about the Route we get a business card saying: "End of the Trail, Beginning of the Dream...". We need nothing more. We plough through Los Angeles, one of the most jammed cities of the United States and from now on we stick to signs leading to the East. Past San Bernardino, where 75 years ago the first McDonald's in the world was opened, we drive through a mountain range and... reach the huge Mojave Desert. 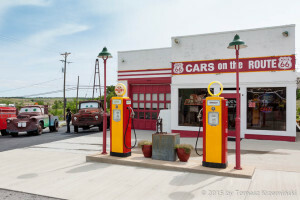 “In the middle of nowhere” is a common description of some places along Route 66. In this middle of nowhere there is the first curiosity - Bottle Tree Ranch. 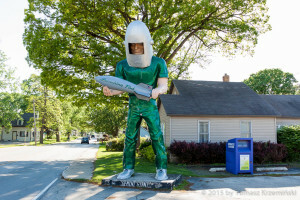 We will see many more such strange ideas and wonderful places during our trip. The first night on the road is in the most genuine Route 66 motel in Barstow - a place that until now we have only seen in films. Low buildings, one room next to another and each entered straight from the street. Parked cars and pick-ups right under the bedroom windows, a few feet from the bed. You can fall asleep looking at your beloved vehicle. It's just a shame that you can't park a big truck here. The owners are a treasury of information about the road. We find out from them that quite near Route 66 is flooded and impassable, so we'll take a detour. From the era of horse wagons we jump onto a highway. The traffic is far lighter than in Europe. But the trucks! 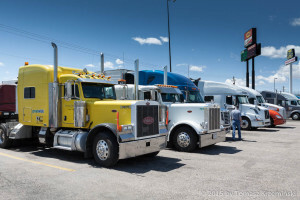 Huge trucks with trailers of Mack, Peterbilt, Freightliner, International, Western Star, or familiar in Europe Volvo (but with a "nose”) travel with the maximum allowed speed of 75mph, which is 120 km/h. Four lanes one way, a median strip so wide that another highway could fit there, and four lanes in the opposite direction. Police patrols and local sheriffs maintain law and order even from the air, out of choppers flying over the road. 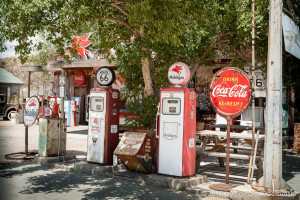 We come back onto Route 66 in Needles and from the rich and fertile California we enter Arizona which prides itself on the longest uninterrupted section of the Route. 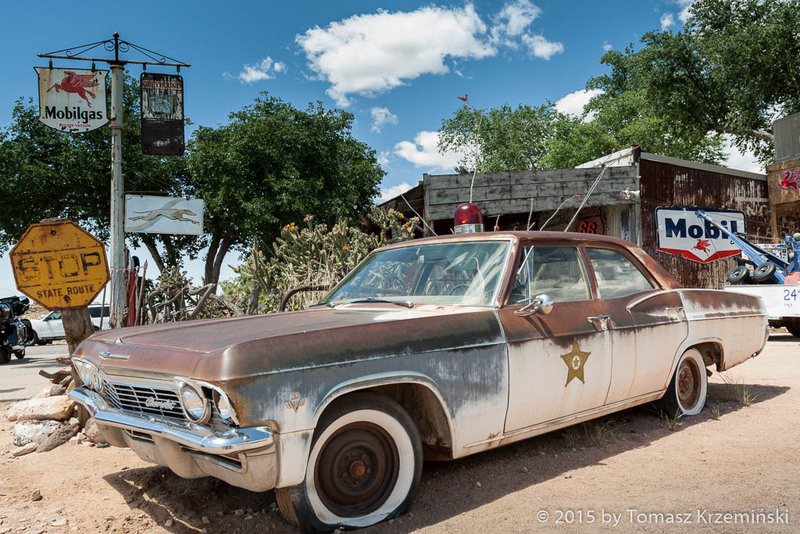 We start seeing old, closed gas stations, rusty pick-ups growing into the land, sand and bushes, sometimes a car which used to belong to a sheriff. Abandoned auto repair shops, heaps of beautiful junk which was brand new half a century ago. Then, when car industry was at its peak in America, the time of huge limousines with 5-liter engines, front lights in shapes never seen in Europe, paintjobs in the color of candy. Gas guzzlers, but who pays attention to that in a country where, even today, gas can cost $2/gallon (2PLN/liter). There are many comebacks to the 50's and 60's. 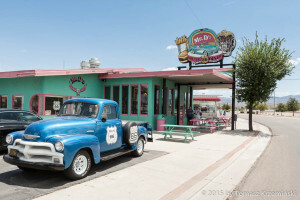 There are many restaurants open along Route 66 since then, some of them never closed during this time. Not much to look at from the outside, inside they delight us with their decor and exquisite food. Obligatory long bar with round, metal seats, booths with soft seaters, historical pictures on the walls and the recurring theme of Elvis Presley and Marilyn Monroe. Waitresses in pink and aquamarine uniforms serve burgers, sweet pancakes, free refills of coffee and soda. And again, we feel like we're in an American movie. The areas we pass are inhabited by Native American tribes - Apache, Cherokee, and Navajo. 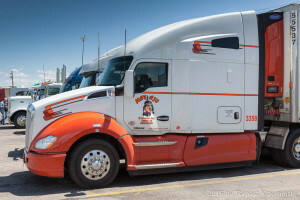 Even at a truck stop in Kingman we see a beautiful Kenworth with a Navajo Indian logo. However, the main occupation of Native Americans here is selling jewellery. Driving though the following states we notice huge differences not only in the landscape and weather but also people, cuisine and customs. The place which moves my heart the most is the Arizona waste with sand-covered road, 18-wheelers and pick-ups (which Americans also call trucks) in New Mexico, and of course the cowboy Texas and Oklahoma. I have an irresistible feeling that our contemporary truck drivers are cowboys who transferred from horses. 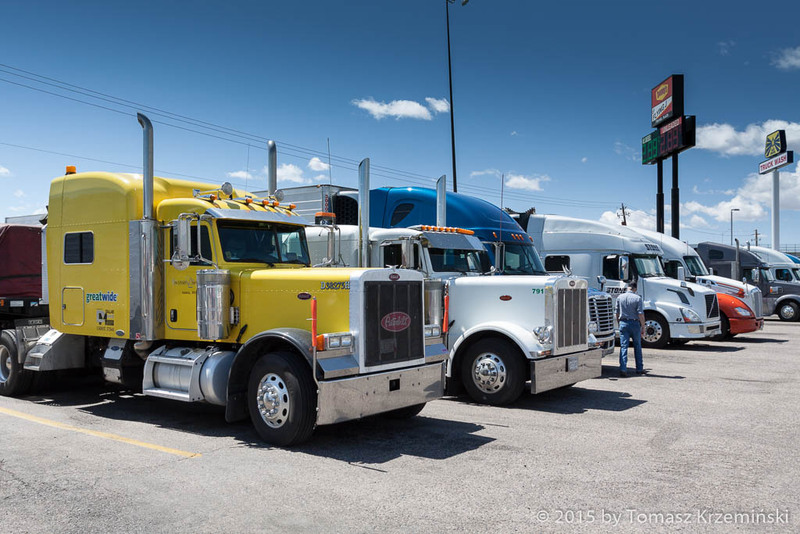 In cowboy hats, Wranglers and boots with spurs, it is quite a common view on the streets here, with their ethos of hard work which they love and hard-line rules - it is the embodiment of Truckers. Those who keep both our Europe and America in constant motion providing people with everything they need in life. Plus the country music, without which nobody gets behind the wheel. And the largest number of refineries in the USA - right here in cowboy Texas. Gas stations are a paradise for drivers. 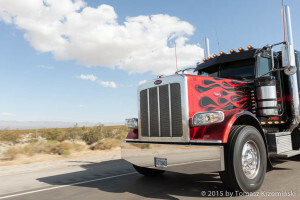 Bars, shops with truck gear, food prices same as in the city. Big parking lots with facilities, including car washes and small repair shops. You can take a shower, use a laundromat or watch TV. Sometimes you can even gamble in a casino. 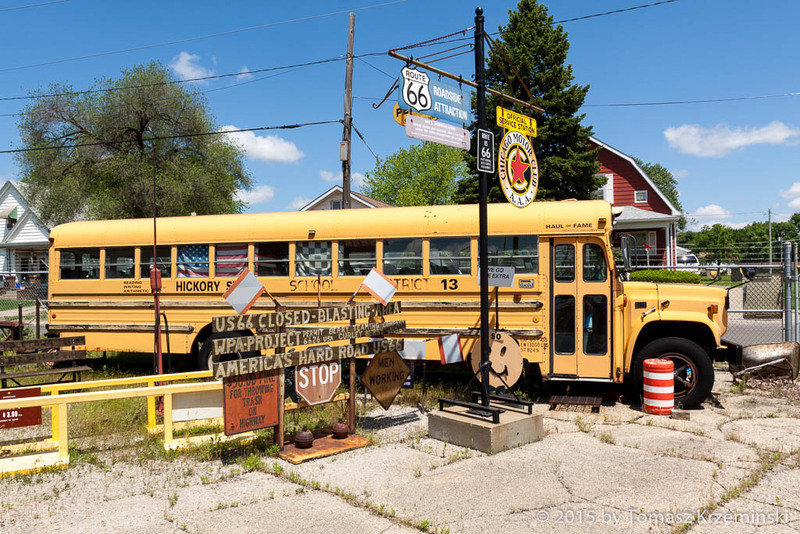 In a museum in Clinton you can learn the whole history of the mystical route from 1926 when it was built to finally "conquer the Wild West". And of course to give a chance of unhampered travel for the cars overflowing the market - Ford Ts, the first in the world mass produced cars. Unfortunately, the upcoming 30's where the times of Great Depression and Dust Bowl - dust storms in the middle states. People, in masses, set off in their shabby cars down Route 66 to their dream California where they were to find work, food and good conditions for life. Later, in the 40's, the road remembered military transport heading to the west coast. And finally the 50's and 60's - a historical boom, Americans get rich, whole families take Route 66 on their weekends and holidays. 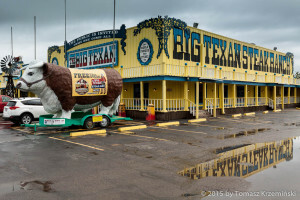 It is the time for numerous motels with neons flashing at nights, restaurants, rest stops, small shops. The road blossoms and the sentiment remains until today. However, the government is already preparing a new highway plan based on German autobahns. As a result in 1984 Route 66 ultimately disappears from road maps. The new highway, mainly interstate I-40, runs next to or completely replaces the previous road. After 20 years of methodical transferring the traffic onto the highway the towns die out, gas stations and bars fall into ruin and people are left without work and further perspectives in life along the Route. 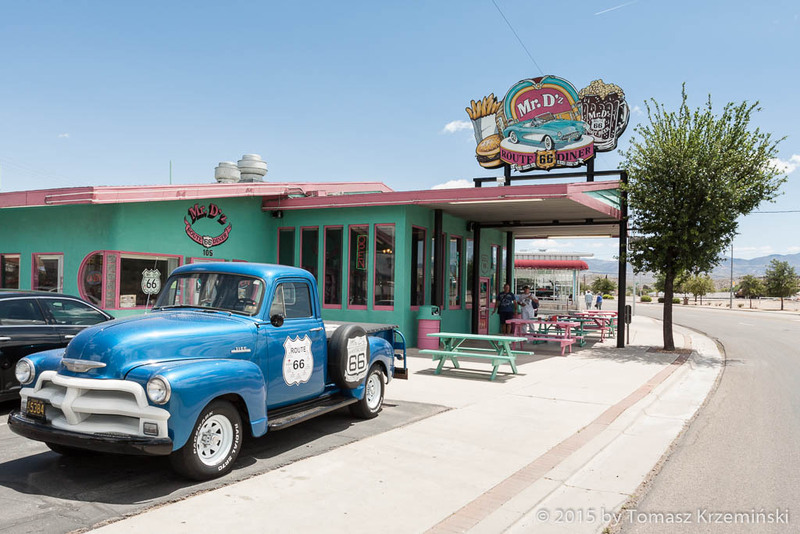 The first person who will not put up with this is Angel Delgadillo, a barber from Seligman, who revives Route 66 with his grand dreams and efficient actions. 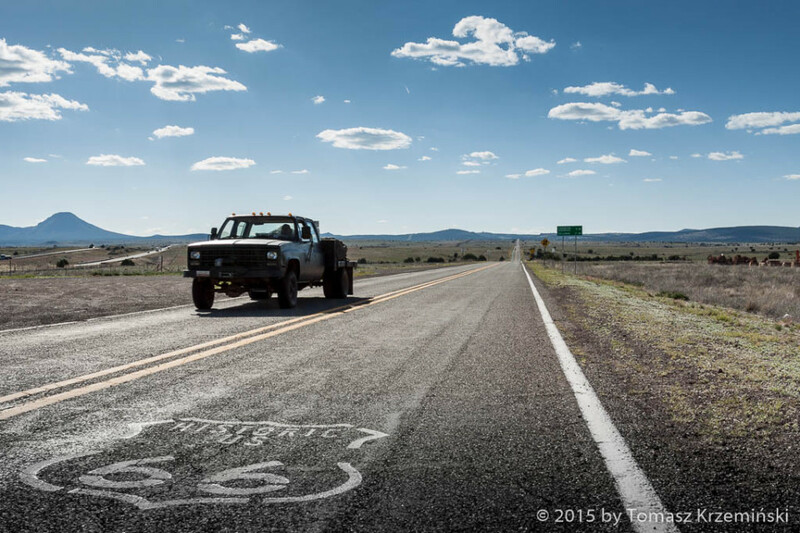 He convinces the authorities to mark a section of the road in his city as Historical Route 66. Later it happens in the neighboring cities, then in the whole state and in the end along the whole road from Chicago to Los Angeles. We will remember Clinton for one more reason. Here we are warned about a twister, which is 20 minutes away from the city! The situation is very serious - we can take shelter, but what will happen with the car? We decide to escape. Fortunately, the weather forecasts are accurate. The tornado is approaching at 45mph and is heading north-east. We are jumping onto the highway and this one time we exceed the 70mph limit driving east, as planned. For 45 minutes we are in danger. The reports on the radio sound terrifying. I don't let my tears of fear to fall on the maps I have on my knees and I mark place after place where the tornado touched the ground and is blowing everything away: trees, road signs, and roofs. How can these have normal lives here? Everything ends well for us. People we asked about it in the nearest Oklahoma City tell us that it is the matter of choice - in the west there are fires, in the south floods, in the east hurricanes and here they have twisters. And life goes on. We go on. Moutains over 2000 m above sea level are far behind us. After the red plains of Oklahoma, the further east we go the greener and... more European it gets, of course only comparing it to the western USA. We drive through Kansas, Missouri and Illinois. After delicious Mexican dishes and Texan steaks now it's time for barbecue. Traffic gets thicker, especially around larger cities. And we continue to discover that it's not only the country that is so big - here they want to have everything huge. Beginning with soda cups, there "the smallest" means 0.7 liter (! ), with cars, which are getting smaller, but they still have large engines (e.g. Nissan Micra 2.0) and ending with Giants... a few-stories-high figures by the road advertising a bar or service shop they stand next to. 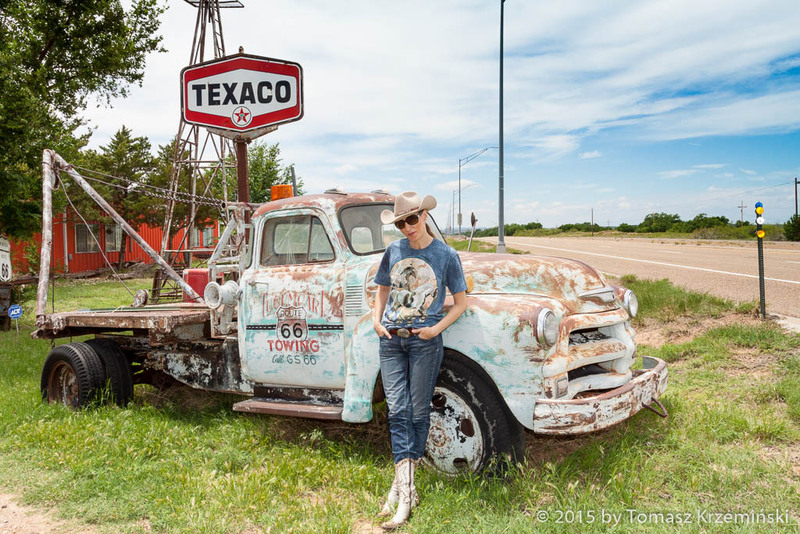 Charisma - I think about this word more and more often as we travel along the road and we meet more important people on Route 66. The conversations with people who fight for another happy day for themselves and others, fulfilling their American Dream, light up our hearts. And here it turns out that this American Dream is not only money, but mostly it is doing what you love every day of your life. Which often means sacrifices, hard work, overcoming obstacles, but it gives happiness. I myself feel like I'm growing wings and this is probably the most important thing you gain travelling Route 66 - faith in your plans and dreams and strength to fulfil them. 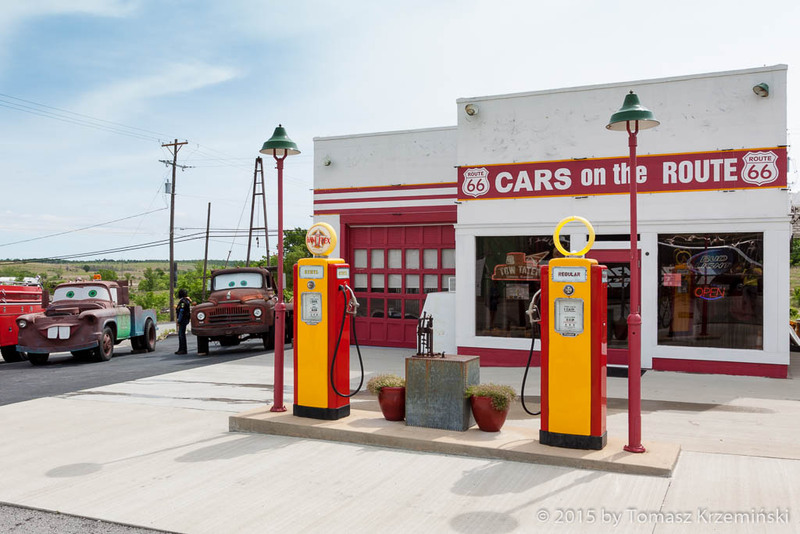 Good maps and conversations with people guarantee you to travel the 85% of Route 66 that remains today. It is the knowledge and time that determine if we take the original route (we do it whenever we can) even when sometimes it turns into a technical road along I-40 or if we take the highway and exit it to visit towns that remember the great times of the Route and bloom until today. Thanks to tourists, travellers from all over the world and truckers who deliver more and more goods, the road is coming back to life. Amazing, incredible, like from a long hidden dream about freedom, independence and all-embracing happiness. 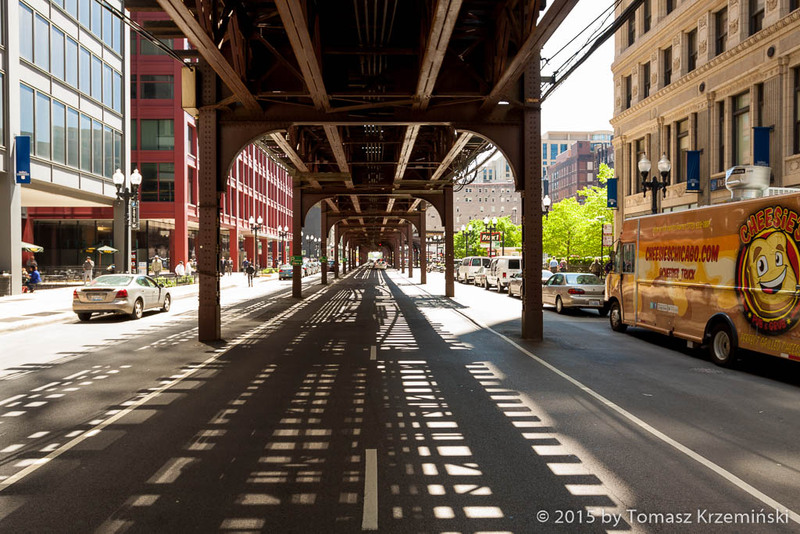 And there's just the hum of the wheels, wind against the hood and the stripe of asphalt in front of you. That's how dreams come true. A Kenworth with a Navajo Indian painted on it - is there anything more American? My cowboy boots, like the Nicolas Cage's snakeskin jacket in "Wild at Heart", are the "symbol of individuality and belief in personal freedom"
...and nothing but the road ahead of us, sky above us and huge trucks in cowboy Texas - do we need anything else to be happy? Posted in Press articles on 2015-12-16 by Honorata Stolarzewicz.